The wicket seemed to have suffered a little from a 20/20 match played before the 3rd Test, but the England bowlers took advantage of the bare patches by using them to move the ball for some near misses. Watson & Rogers, however, proved to be a strong pairing refusing to bow to the bowling & hit shot after shot. Not wanting them to settle in Bresnan bowled to Watson who edged it to Cook catching him for 19. Swann bowled to Kawaja who seemed to catch a nick & was caught by Prior. But Kawaja didn’t move & asked for a review. Hotspot didn’t show a hit but there was a noise as the ball passed the bat & the decision stood. Kawaja was out for 1. Rogers was next to fall with cries of LBW off Swann’s bowling. Roger’s looked to review & had a chat with Clarke, but Clarke said “no” & Roger’s left the field for 84. It proved to be a good decision from Clarke not to allow a review as the ball would have hit the middle stump. Swann bowled to Smith & more cries of LBW were raised but the umpire shook his head. 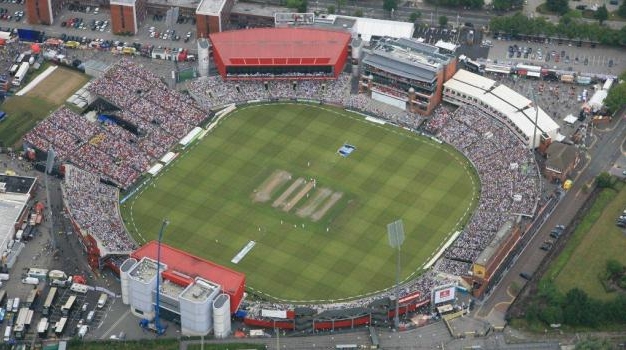 England crowded round Cook & decided to review but it went down to ‘umpires call’ & Smith got another chance. Australia continued to push on & Clarke reached his 50 after confidently knocking the ball for 4. Next Anderson had a go at Smith & cries of LBW were heard again. But again the umpire stood unmoved. Cook decided to review without much hesitation. Nothing was shown on hotspot although a loud noise could be heard as the ball passed the bat. It was decided that there was not enough evidence to overrule the umpire’s decision. Smith’s luck continued when Broad bowled to him & called for LBW. Yet again the umpire said “no” & with no more reviews left England were unable to challenge the decision. The replay showed, unfortunately for England, that Smith was in fact out. Australia settled in & seemed very comfortable knocking the ball around. The England bowlers seemed to be trying everything but the Australian batsmen took it all in their stride. They defended well & scored where they could without doing anything silly. The 2nd day started off well for the Australians as Clarke & Smith continued to push through the runs. Cries of LBW were heard after Anderson bowled to Smith but the umpire signalled a no ball as Anderson’s hand had dislodged the bails of the wicket at his end as he passed during his bowl. Thankfully the replay showed that Smith wouldn’t have been out anyway. The game plodded on & Swann was given 1/2 a chance to catch Clarke but (to be fair) the ball was coming at him with such a pace he would have been lucky to have kept hold of it. Clarke & Smith reached their 200 partnership. Smith’s luck finally ran out as he hit a ball from Swann skyward & was caught by Bairstow. Smith out for 89. Clarke reached 150 runs but didn’t make a big show of his celebration. Warner didn’t have long to get into the swing of things. He nicked a ball from Swann, which hit Prior’s glove as he missed the catch, Trott came forward & held onto it. Warner was furious & moved forward to talk to Clarke about reviewing. In my opinion Clarke should have seen what had happened & told Warner to go without reviewing but he didn’t. Instead Clarke allowed Warner to waste a review proving he had hit the ball. Warner was out for 5 & he left the field to as many boos as he had entered to. Haddin started his game with some big hits, adamant to show he was up for the fight attacking every ball. Clarke had a quiet word with him after a few near misses, telling him to calm down. The match passed on with little excitement as Australia continued to gain runs. Then Broad bowled to Clarke, who seemed undecided as to whether he should play the ball or get out of the way. The ball caught the very top of his bat & rebounded down straight into the stumps. A big wicket for England & Broad’s 200th Test wicket too. Clarke was out for 187 & received a well deserved standing ovation as he left the field. Building on this renewed energy Swann bowled to Siddle who tried to pull the ball for a big hit but misjudged it & was out for 1. Starc was next to enter the field, he & Haddin settled down to enjoy themselves hitting big shots, boundaries & generally pushing through the runs to reach their 50 partnership. Starc also celebrated reaching 50. 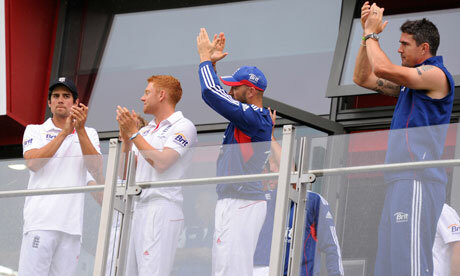 15 minutes of play after tea saw Australia at 527-7, Clarke waved his hands on the balcony to signal he was declaring. There was a brief moment of excitement once England were in to bat as Cook nicked the ball. It hit Haddin’s thigh & span up into the air. Luckily for Cook, Clarke could not get to it quickly enough & it hit the ground. The physio was called onto the pitch to look at Cook, causing concern that he was not quite right but he continued on. Siddle bowled to Root who caught the slightest of touches & was caught by Haddin for 8. Bresnan was sent out as night watchman but was caught behind. He considered reviewing & spoke to Cook. It seemed they didn’t want to ‘waste’ a review on a night watchman so he walked for 1. Had they decided to review he would have been deemed not out as he hadn’t hit the ball, it had hit his hip. Cook should have seen this from his end & Bresnan should have felt whether he had hit the ball or not. All in all it was a bit of bad luck for England. Trott & Cook both had near misses as they shunned defensive playing for runs but manage to hold on. The 3rd day started calmly with Cook seemingly better. Trott edged a ball from Harris to Clarke who caught him for 5. Pieterson started out nervously trying to find his stride. As Pieterson settled into the game he started to hit bigger shots & find more boundaries. Haddin proved his ability as he leaped for a ball hit by Cook & caught him for 62. He leaped again in the game, this time after catching a ball ‘hit’ by Bell, screaming “out!”. But no one else moved & the umpire ignored his cry. The replay & ‘snick-o-meter’ showed he was right to call for out as Bell made the slightest of touches. Pieterson started to look comfortable in the game smashing the ball for 6 several times to reach his 50. Bell followed suit & smashed one of his own for 6. Pieterson went for a big hit but missed & the ball hit his pad. The Australian’s shouted for LBW but the umpire disagreed. Luckily for England, Australia did not review. If they had have done Pieterson would have been out! Bell & Pieterson continued to push through the runs, both looked as though they had found their stride. Bell reached 50 & they reached their 100 partnership. Harris disrupted England’s rhythm & bowled Bell for 60. Pieterson reached 100 by smacking the ball for 4. Baistow was caught for 22 by Watson & soon after Pieterson was bowled LBW by Starc. Pieterson did review the LBW call, though it was decided he was out. If you look closely you can see the slightest of white marks on hotspot & you can hear a noise on ‘snick-o-meter’ but it was deemed not enough to overturn the umpire’s original decision. Broad & Prior started day 4 calmly taking advantage of big shots when they could but generally trying to take it one ball at a time in order to avoid the follow on. Broad unfortunately nicked the ball & was caught by Haddin, knowing he’d made contact with the ball he walked for 32. Swann started his session with some good strokes including a 6 but caught a ball from Siddle on the inside edge of his bat & was caught by Haddin for 11. Siddle got into the act again bowling to Prior who edged the ball high up into the air & was caught by Warner. England were all out for 368. They had avoided the follow on but still had a lot of work to do being 159 runs behind. Rogers & Warner were first to bat for Australia. Anderson started the bowling with a sense of urgency & aggression. Both Rogers & Warner made a good start with big shots, but Rogers tried a little too much & was caught by Broad for 12. Warner proved shot after shot why he was back on the Australian side. There was a glimmer of hope for England when they thought he had clipped the top edge of his bat & was caught by Prior. The umpire disagreed & unfortunately for England their review proved Warner didn’t touch the ball. ‘Snick-o-meter’ confused the issue by showing a sound as the ball flew passed the bat. It would be interesting to see whether the technology used is reviewed after this Test. Warner took advantage of his 2nd chance & kept the shots coming. Bresnan showed some fighting spirit bowling a bouncer to Warner which smacked him in the chest. Warner smacked another ball across the ground but was caught this time by Root (of all people) who pumped his fist in the air to cheers from the crowd. Warner left the field to more boos for 41. The excitement continued with a miss stumping as Kawaja stepped out of his crease to smack the ball across the field but missed. Luckily for him Prior missed the ball too. Swann made up for this by bowling Kawaja for 24 as the ball caught his bat & hit the stumps. Watson then fell for a short ball from Bresnan which he struck high & was caught by Pieterson for 18. Smith showed his worth & fight as he hammered Swann’s ball for 6 on 2 occasions. Australia got themselves in a muddle & helped out England when Smith eager to go for 2 runs was sent back by Clarke & run out by Anderson for 19. Tea was taken 10 minutes early due to rain. Anderson & Swann started bowling in the session after tea positively. Clarke & Haddin looked comfortable for the most part batting sensibly, until Haddin skied a ball from Anderson & was caught by Broad for 8. Swann bowled to Clarke who seemed to nick the ball slightly to be caught by Prior. The umpire disregarded the cries of out so England chose to review. The replay showed there was a noise but hotspot showed it was the pad not the bat. Starc popped a ball up from Anderson straight into the hands of Swann & he was out for 11. Starc stood his ground hoping for a no ball but had to walk. The umpires came together for a discussion & decide that the game should be delayed due to bad light. Clarke furiously tried to change their minds but was unsuccessful. Play was then ended for the day as the rain came down. All this played into England’s hands as the match looked more likely to end in a draw. The 5th day started slightly delayed but got off to a cracking start for Australia who got Cook out for 0! Cook did choose to review, perhaps he misinterpreted catching his pad with his bat as hitting the ball, but he had to walk. Root & Trott did what they could to get the runs going. Root showed some signs of nervousness, unsure what to play & what to leave. Cries of LBW filled the air after Harris bowled to Trott. The umpire said “no” but Australia reviewed. Luckily for England it came down to ‘umpires call’ & Trott remained in though not for long as he nicked a ball from Harris to Haddin & was caught for 11. Pieterson & Root knew they needed to keep the runs coming but without risking themselves as they needed to bat the day out & go for a draw. Root was lucky when he was dropped by Clarke who couldn’t wrap his hands around the ball. Lyon showed some fire bowling to Pieterson who tried to smack the ball about without success. Siddle bowled to Pieterson who nicked the ball & was caught by Haddin. The umpire agreed but Pieterson was adamant he hadn’t hit the ball & reviewed. Unfortunately for him you can clearly hear a noise as the ball passed bat in the replay. Hotspot didn’t show a thing but as we’ve learnt from this Test it’s not always reliable. Third umpire could not conclusively disagree with the original decision & Pieterson had to walk for 8. As the teams came back onto the field after lunch the the black clouds loomed & it wasn’t long before the rain started to fall. The 3rd Test ended anticlimactically due to the weather but England can now breathe a sigh of relief as they retain the ashes. Australia – Clarke for his 187 in his 1st innings. England – Swann for getting 5 wickets in the 1st innings. This entry was posted in Extracurricular Sport and tagged 2013, Ashes, Australia, Batting, Bob Woolmer, Bob Woolmer Sales, Bowling, Clarke, Cook, Cricket, England, Game, Kawaja, Lords, Pietersen, Siddle, Trott. To prepare for the 4th Test which starts today here is my roundup of the 3rd Test from my work blog.